SINGAPORE - The Government announced tweaks to property cooling measures on Friday (March 10). 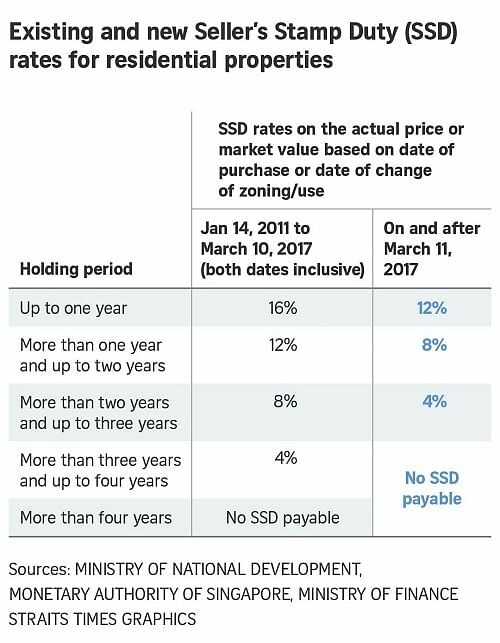 With effect from Saturday (March 11), changes to the Seller's Stamp Duty (SSD) and Total Debt Servicing Ratio (TDSR) framework will take effect, but current rules on Additional Buyer's Stamp Duty and the general loan-to-value (LTV) limits will stay the same. Financial institutions must ensure that borrowers' monthly repayment for all debts does not exceed 60 per cent of their monthly income. What's the change: There is no change to the 60 per cent threshold, but it will no longer apply to mortgage equity withdrawal loans with loan-to-value ratios of 50 per cent and below. What's the change: The following changes apply only to homes bought on or after March 11, 2017. What's the change: No change. "There is firm demand for private housing, in part because of current low interest rates and continued income growth," the authorities said on Friday. Loan to value (LTV) is the housing loan quantum a bank or financial institution is willing offer as a percentage of the property's valuation. LTV limits were tightened in 2013. LTV is now up to 80 per cent of the property's value but subject to TDSR. It also depends on whether this is your first, second or subsequent mortgage and your loan tenure.